Newcastle, July 10th, 1838. 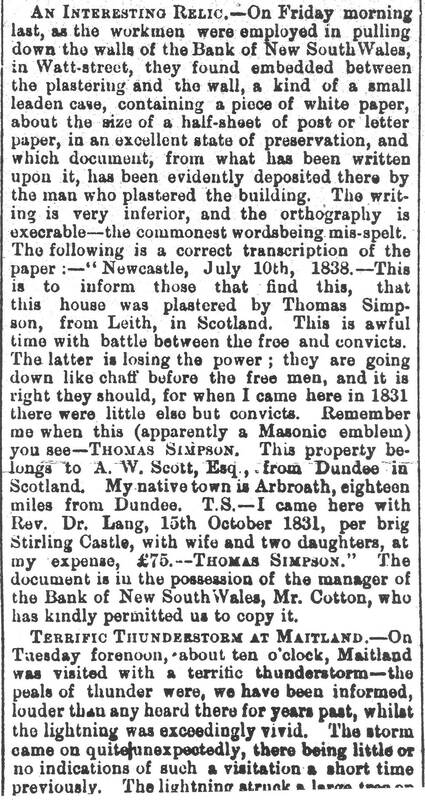 – This is to inform those that find this, that this house was plastered by Thomas Simpson, from Leith in Scotland. This is awful time with battle between the free and convicts. The latter is losing the power; they are going down like chaff before the free men, and it is right they should, for when I came here in 1831 there were little else but convicts. Remember me when this (apparently a Masonic emblem) you see – THOMAS SIMPSON. This property belongs to A.W. Scott, Esq., from Dundee in Scotland. My native town is Arbroath, eighteen miles from Dundee. T.S. – I came here with Rev. Dr Lang, 15th October, 1831, per brig Stirling Castle, with wife and two daughters, at my expense, £75. – THOMAS SIMPSON. This interesting undated newspaper article was found whilst accessioning the papers of the late Ross Deamer into the University’s archives. It in turn was copied from a file held in the Mitchell Library under the title of ‘J. Dickson Journal and Notes 1838-1877’ (M.L. MSS 1972). I tried to locate the original Newcastle Chronicle story in Trove, but couldn’t locate it. A copy of this story was relayed in the Queanbeyan Age under their Colonial Extracts as ‘A Curious Discovery’ on Thursday 3rd November 1870. The article is interesting in its alternate text of ‘P.S.’ instead of ‘T.S.’ and ‘£15’ instead of ‘£75’. Thanks to Jen Willets who located the story in the Maitland Mercury Saturday 22 October 1870 p.3 The original story was therefore possibly published in the Newcastle Chronicle on the previous Thursday 20th October 1870, reporting the discovery made on Friday 14th October 1870. Mr. Henry Bayes Cotton, who died at his residence, Hunter’s Hill, yesterday, at the age of 86, was one of the oldest colonists of New South Wales. He arrived In Sydney, in 1830, and joined the Bank of New South Wales. He was manager of the bank at Geelong when the Ballarat gold fields were at their zenith, and was afterwards manager of the branch at Newcastle for 25 years, in the latter city Mr. Cotton commanded the respect and esteem of all classes. He took an active part in many public matters, especially in the establishment of the School of Arts in that city, and he lent valuable assistance during many years in making it a successful institution. He was a member of the Church of England, and took a keen Interest in everything connected with its welfare, being an energetic and zealous worker as lay reader and member of the Synod. Retiring from the service of the bank about 15 years ago, Mr. Cotton took up his residence at Hunter’s Hill. He has left three sons. It was possibly donated as a “curiosity” to a collection to a School of Arts, or Institute of some kind at the time in Newcastle, probably the Newcastle School of Arts which we understand Mr Cotton helped establish. If anyone does know what became of Mr Cotton’s personal papers or knows what became of Thomas Simpson’s 1838 note we would like to know. The same article was also in the Maitland Mercury on 22 October 1870. The Manager of the Bank of New South Wales recorded in the Newcastle Directory 1880/81 was Henry Bayes Cotton. He lived in Newcastle for 25 years and retired to Sydney in 1888. In his retirement he lived at Figtree, Hunter’s Hill area. He died in January 1906 aged 86. The Newcastle Family History Society is beginning a second publication to follow on from their ‘Early Newcastle: The Fettered & The Free’. This publication will be specifically looking at the female convicts who came to Newcastle. We have found some wonderful information on your website http://www.jenwilletts.com/ and would like to make contact with you (we would also like to ensure that we properly acknowledge your contribution to our work). I wonder if you would be kind enough to reply to my email. I am co-ordinating the NFHS research for this publication. Sounds like an interesting project. I look forward to hearing more about it. Hi Jen. This is not related to this thread. Couldn’t find contact details for you elsewhere. RE: I have found the exact location of the Maitland Wine Vault. Thought you might like to update the entry for John Mayo on your website. I have also started a new Facebook page you would be interested in that reveals new facts about Morpeth. Search for the ‘Morpeth History Sleuth’. I’ve been trying to find a way of contacting you. There does not seem to a “contact” link on your website. Anyway, on your website you have a page dedicated to William Bell Carlyle, who I am doing some research on. That newspaper article you posted concerning Granny Sutton…what was its source and date? Looking forward to your correspondence. Thanks Jen. If your date is correct, then that alters the original find date to the Friday before the 22nd October 1870. “There were many social problems in the township of Newcastle in the 1830s and the second wave of convicts to Newcaslte (to complete Macquarie pier) may have contributed to growing tensions between these two groups. 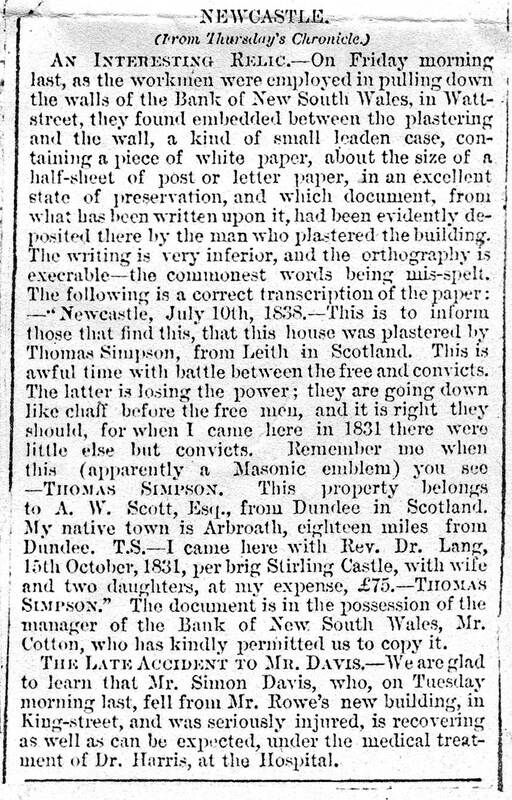 Simpson’s note describes the feeling in the town in 1838 and depicts the dire situation of the convicts at a time when there was a rapid increase of free settlers to Newcastle. Within a decade there had been a rapid transition from what had been a convict settlement to a enterprising sea port. Perhaps the free settlers thought the convicts were taking their jobs or maybe it was the large concentration of convicts the settlers found confronting. The sudden influx of convicts may have unsettled the new arrivals who were expected to live and work nearby one another. The description of going down like ‘chaff’ is an interesting expression and perhaps the author is implying that the convicts were physically assaulted by the free settlers, or neglected by authorities. They may have suffered health problems, becoming sick and unable to work! Either way it does not appear that the free settlers thought much of the convicts in Newcastle in the 1830s.